As you know, one of the keys to reduced food waste in the kitchen is to build a repertoire of waste-busting recipes designed to use stuff up. If it’s leftover veg we’re talking about, one of the happiest homes for what you’ve got would be a good minestrone soup. 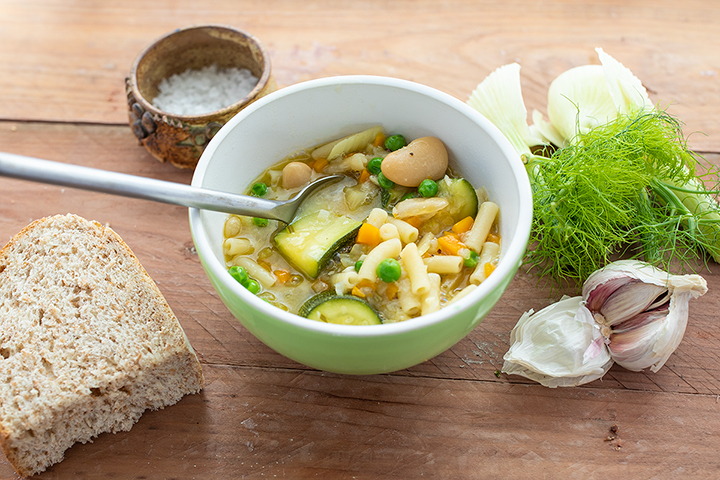 Minestrone Soup isn’t so much a recipe as it is a formula. Start with a gently cooked soffritto - similar to our soffritto in the Sugo recipe, but not caramelised in the cooking. Add your stock and then your veg in order of the longest-to-cook first, so that it’s all cooked right at the end. Add a starch element - often beans and pasta, but can also be potatoes. Its value as a meal to reduce waste lies in its flexibility - within reason, the veg component can be whatever you need to use up. In my case, I had a bulb of fennel in the fridge. I’d bought it to use with another dish and then had decided last minute it wasn’t needed. I also had a courgette fresh from the garden (a precious courgette - with the weeks of unbroken hot dry weather, the courgette plants have been highly unproductive this year, in contrast to the glut of usual years). And, in addition, I had one slightly ropey carrot and two floppy stalks of celery. A soffritto is a perfectly happy home for less than perfect aromatics. I use chicken stock for a soup like this. Since I started making batches of my own stock at home (the butcher’s in the next village is happy to provide chicken carcasses for next to nothing), it’s the easiest thing in the world to grab a container of home-made stock whenever it’s needed. It’s up to you, obviously, but I always think that for a nice soup, if you’re buying stock it’s worth buying good quality stock - since it makes a big difference to the flavour you get. That said, this soup will be perfectly fine with a stock pot or cube - and will work well with chicken or vegetable stock. This version worked well - I loved the slightly aniseed flavour the fennel imparted to the soup base, and it made for an excellent healthy lunch. I would have used cannellini beans by choice but I had none in the cupboard, and I did have these butter beans. They worked just as well. You can use whatever herbs you fancy for extra flavour. The mainstay of my garden is my rosemary bush, so I used rosemary for this one. Thyme is also excellent. You get the idea by now - it’s very adaptable, very quick, very easy. Just the sort of staple you need to adopt to keep your fridge fresh and your bin empty! Make the soffritto - finely chop the onion, carrot, celery and garlic. Just cover the bottom of a medium-sized pan with oil and gently fry the veg and the rosemary until softened but not browned - 10 minutes or so. Add the stock and the water and bring to the boil. Add the fennel, and then the dried pasta and cook for another ten minutes. Add the courgette slices, the butter beans and the frozen peas and cook for another ten minutes. Test the veg for doneness and add salt and pepper to taste. No reason why there should be any for this recipe, unless you don’t have a 200g ‘half’ tin of beans, but decide to use half a large tin instead. If you do, store the remaining beans in water (not in the original tin) in the fridge for up to 3 days. Obviously, it’s very easy to throw a handful of beans into all sorts of meals, so you should be able to use those up. As always, the trick is to plan ahead and know when you’re going to use them when you put them in the fridge.